I kept trying to get a nice water shot in full--the landscape kind that often elude me, so I shifted my perspective and went closer--it meant I would have to take a tripod to the middle of a creek, but I lucked out with this long exposure with the dramatic color in the foreground and a tad bit of it in the left background. FAV - What beautiful clarity and focus in the foreground, and what beautifully silky flow of the water! Its beautiful and very moody. Beautiful long exposure of the water! The wonderful autumn colour in the foreground is such a bonus! Fav! It captures the atmosphere of the stream. Lovely silky effect on the water,love the tones! Instant fav, Daryl. 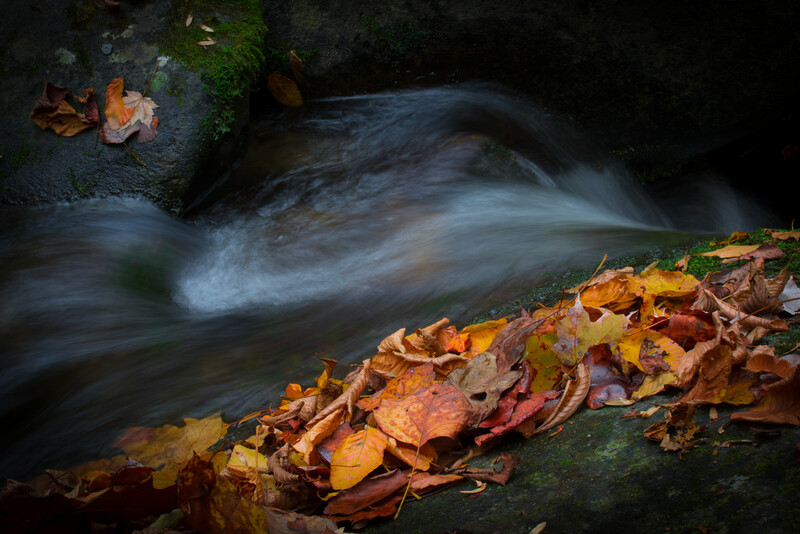 This is stunning -- the contrast of the sharp clarity and color of the leaves, the soft long exposure flow of the water, and the deep deep tones throughout make this such a standout. One of my favorite shots ever. Instant fav! Such a fabulous long exposure. Love the effect you have captured and such a great composition as well. Okay, hope you had waterproof shoes or boots. Brrrr. Great shot. It reminds me of a water fall shot I captured only the leaves were reflected. Gorgeous colors and detail, love the long exposure! Wonderful with that swirl of motion, and the line of autumn colour.